Like any good soup, a bowl of Louisiana gumbo can uplift you even when there is nothing to feel uplifted about. 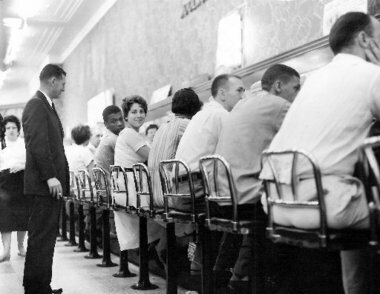 On Sept. 17, 1960, a group of students in New Orleans, three black and one white, sat down at McCrory’s whites-only lunch counter and refused to leave until they were served. The students were convicted of criminal mischief, though that would be overturned by the Supreme Court in Lombard v. Louisiana (1963), a key moment in the fight against segregation. But before this historic meal came another: The sit-in was organized few days earlier over spicy gumbo at Dooky Chase’s Restaurant. Gumbo makes people braver; it satisfies the soul and gets you talking, says Leah Chase, the legendary African-American chef of Creole cuisine, who is still cooking at 94. “Honey, this is where they planned the thing,” she says over the phone from New Orleans, her voice warm and musical. She remembers the young activists who belonged to CORE — the Congress of Racial Equality — eating a series of lunches and dinners that September in her restaurant’s upstairs room. Another activist who regularly ate there was Raphael Cassimere Jr., an emeritus history professor at the University of New Orleans. Cassimere remembers meetings of the N.A.A.C.P., whose office was a few blocks away, where people got “all steamed up,” but as soon as everyone was sitting down with Chase’s gumbo, “you’d be laughing again.” This gumbo was like the food of Louisiana grandmothers, Cassimere recalls, except that “you could get it 24 hours. And it was cheap.” Sometimes, in an extra-generous mood, Chase didn’t charge at all. She fed many of the Freedom Riders, who took a series of perilous bus trips through the South in 1961, trying to use whites-only restrooms and restaurants along the way. Sometimes the activists arrived at the restaurant dirty, right out of jail. “Poor darlings,” she says. “I used to feel so sorry for them.” Chase sent them around the corner to Vergie’s home to take a bath. And then she fed them. New Orleans Thanks to my new library card, I stumbled onto the library’s homepage last weekend to learn how to order books on-line, and what do you know there was an announcement of a event commemorating the 50th Anniversary of the Freedom Rides of 1961 complete with a traveling exhibit and speakers, so I trundled down to the dimly lit main library in the pitch dark of this abandoned stretch of the CBD with what turned out to be 30 others. What a treat this was thanks to Dodie Smith-Simmons joined by several other civil rights veterans of those days who shared their stories. Dodie Smith (at the time) joined the NAACP Youth Council at 15, largely as she said, because her older sister was going, and she wasn’t going to stay home, and joined the marches and sit-ins in New Orleans at the time which were being led by Rudy Lombard and Jerome Smith. When the “adult” branch of the NAACP came and met with the Youth Council and told them that they would not bail them out if they got arrested, she told us last night, “that’s when I knew this was for me!” As the beat quickened she got involved with CORE, the Congress of Racial Equality, because that was where the action was, and became secretary of the local chapter under the now legendary Oretha Haley. CORE, joined by SNCC and others, had announced the Freedom Rides in 1961 to challenge the fact that despite the Interstate Commerce Commission (ICC) having directed that bus transportation between states had to be integrated fully at every level, it was not being enforced despite several court challenges which had been dismissed. This was a classic campaign opportunity where the “handle” legally was crystal clear and the critical ingredient of “moral rightness” was transcendent, so the tactic of a Freedom Ride on buses beginning in Washington, DC and ending in New Orleans was brilliantly devised to create maximum pressure on the new John F. Kennedy White House. In many locations there were few difficulties, but in places like Birmingham and Anniston, Alabama the dogs of hate were off the chains. Dodie still remembered with regret not being allowed by Haley to go on the Rides that then originated in New Orleans to reinvigorate the Freedom Rides in Mississippi. Hundreds of the riders were dispatched to New Orleans for non-violence training before being allowed to travel. It was Dodie’s job to do the training, so she was stuck behind the lines. In Mississippi the powers-that-be decided that the Alabama violence was not going to happen there, so they immediately arrested the reinforcements putting literally hundreds, including James Farmer, the head of CORE, first in the Hinds County jail in Jackson, and then moving the whole bunch of them to Parchman Prison. All of this was vivid to me, and frankly, personal. I knew Parchman Prison well and had often been on the grounds. Parchman was notorious as a prison hell-hole made famous by Leadbelly, but it was also smack dab in Sunflower County in the heart of the Mississippi Delta cotton country. About a dozen miles down the road was then small town of Drew, which is even smaller now, with the sign “Home of Archie Manning” now long faded. My mother and uncles were born and raised in Drew, and my Grandmother and one of my great aunts lived there until they died. My Aunt Sue was the postmistress in Drew, where my Grandmother also did a number of years at the mail window. When my family transferred to New Orleans around 1957 after stints in Wyoming, Colorado and Kentucky, every Thanksgiving and a week or so in the summer found us not in the big city of New Orleans, but visiting old ladies in Drew. One of the rituals of these trips was driving with Aunt Sue to deliver the mail to Parchman Prison. She drove a 3-hole Buick and the most dangerous part of the ride was not Parchman, but the fact that she drove the whole way with one set of tires on the pavement and the other on the dirt shoulder. My brother and I would jump out of her car when she stopped on the prison grounds like we were on a jailbreak! Fannie Lou Hamer, the great civil rights legend, lived down the highway the other direction from Parchman in Ruleville. Her cousin took care of my grandmother at home during the last years of my grandmother’s life. Even as boys there was no avoiding the constant conversations with adults in Drew caught with the world changing all around them, but in New Orleans it was even more evident despite our youth, since change was all around us whether we got in trouble sitting in the back of the bus, because “we liked it” and didn’t understand “the screen” – the movable wooden sign inserted in the seat that said “colored only” — or liked the soda fountain at Woolworths and didn’t care if it was integrated or not, because as we were often told we “weren’t from here, so we didn’t understand.” Luckily, we never understood in “that” way. Dodie talked about how important SUNO and LSUNO were as factories for the protests from the young. Others added the names of so many that helped lead the civil rights struggles from New Orleans and how important, and overlooked, the role of the city as part of the crucible of civil rights. A choir was there singing “Jacob’s Ladder” and other spirituals, and moved with Dodie when she led us all in singing “We Shall Overcome” to open and close this rare and special meeting. It was good to say “thanks” to some of the veterans and listening to these stories of courage and often pain of beatings and jail time told with humor and spirit, and realize how much change we have seen, how big our debts are, as well as how much still remains to be done.